Identificationof rock-forming minerals in thin section is a key skill needed by all earth science students and practising geologists. 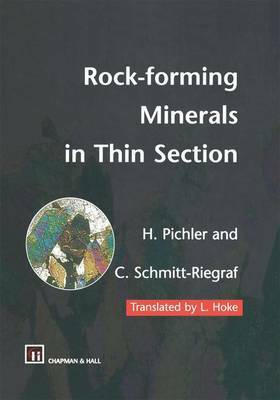 This translation of the completely revised and updated German second edition (by Leonore Hoke, Institute of Geological and Nuclear Sciences, New Zealand) provides a comprehensive guide to identifying 140 of the most important rock-forming mineral species. The book is divided into three main parts. Part A is a practical guide to the fundamentals of crystal optics, polarization microscopy and the practical use of microscopes. Part B gives a detailed description of the characteristic optical features, special features, and the paragenesis of the most common rock-forming minerals. This well-illustrated part is divided into opaque minerals, isotropic, uniaxial and optical biaxial mineral groups. Part C contains identification tables for the minerals and diagrams showing the international classification of magmatic rocks, as well as a colour plate section showing crystal forms of minerals. The book will provide an invaluable guide to all undergraduate earth scientists, as well as to professional geologists requiring an overview of mineral identification in thin section.